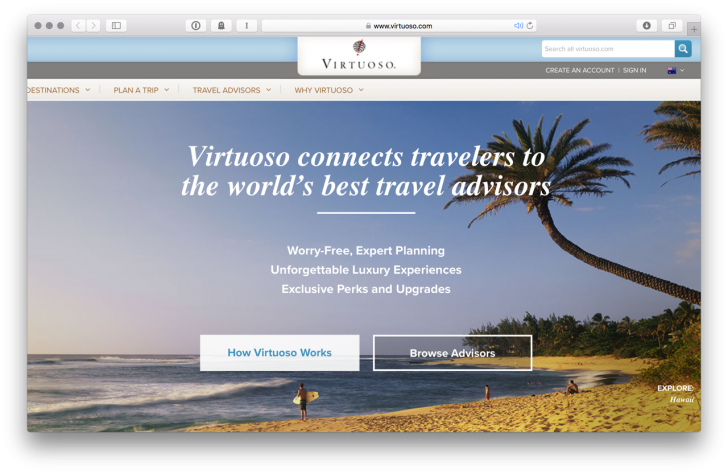 ‘Virtuoso’ is a travel agent only booking channel that offers customers free room upgrades, breakfast and a $100 USD hotel credits, and often at a cheaper rates than many of the popular online travel booking websites. The system operates through an international network of travel advisors and includes over 1,300 hotel properties worldwide, from large chains to small boutique properties. When booking a property through a Virtuoso travel advisor, you can gain access to a number of exclusive services and ‘perks’ not available elsewhere. These benefits can add hundreds of dollars of value to your stay – you just need to work with a Virtuoso accredited travel agent to make your booking. What benefits can I expect to access when I book a Virtuoso property? Daily breakfast for up to two people. Note that these benefits apply per stay, so you’ll get maximum value if you’re only booking in for one night. Who is eligible to book a Virtuoso property? Booking a Virtuoso property is open to all members of the public. While there are similar schemes in operation such as the American Express Fine Hotels and Resorts program, these are typically only available to those holding an ultra-premium credit card like the American Express Platinum Card. The caveat with Virtuoso properties is that you must book via a Virtuoso affiliated travel advisor. How do I book a Virtuoso property? Almost all Virtuoso bookings are accessible offline only, which means that you need to get in touch with an advisor via email or phone in order to check rates for a preferred destination or property, and then organise for them to complete the booking on your behalf. You can find a list of all Australian-based Virtuoso travel advisors here. However, if you’re like me, you probably prefer to undertake all your pricing research and book your hotels online. Luckily, one Virtuoso travel partner allows you to do so. It’s an American based partner named Classic Travel. You can search for all Virtuoso properties (including pricing and a list of benefits offered) and then complete bookings via their website here. It’s worth noting we aren’t recommending everyone should book through Classic Travel – instead it might be a good opportunity to work with and support a local travel agent who is affiliated with Virtuoso. How does Virtuoso pricing compare? Virtuoso typically offers some of the best flexible pricing I can find. That means that you need to book the flexible rate at the hotel; booking a pre-paid rate won’t provide the exclusive benefits. I’m currently in the process of researching a hotel stay for a one night stopover in Abu Dhabi next August. I’ll be flying the first class Etihad Apartment from Melbourne to London. My plan is to break the journey up in the middle (after all, there is only so much champagne and rich airline food you can consume without taking a break!). 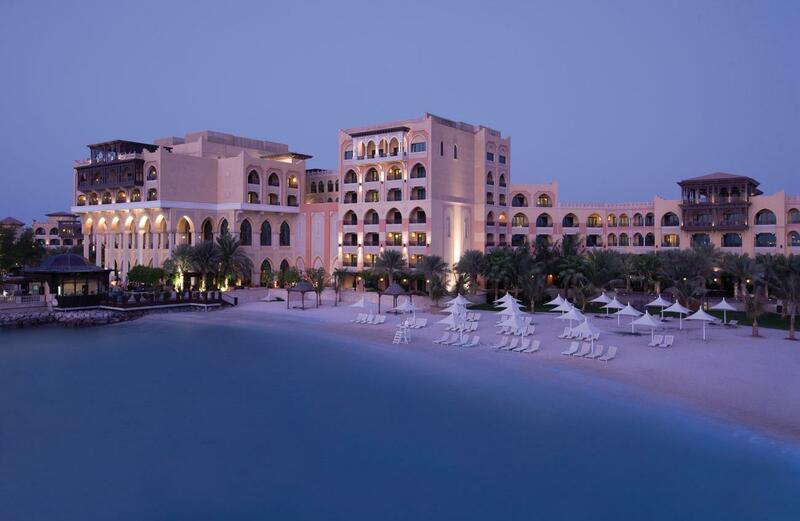 I’ve heard good things about the Shangri-La Qaryat Al Beri, and recently set about investigating prices. My usual starting point for price comparisons is Booking.com. I’d consider these ‘extras’ to be valued at least $300 AUD, even without taking into consideration the welcome amenity and early check in/late checkout. Based on the prices advertised on Booking.com, the estimated value of a one category room upgrade is $56 AUD per night, the daily buffet breakfast for two people is worth $102 AUD ($51 AUD per person) and the $100 USD food and beverage benefit comes in at $133 AUD at today’s exchange rates. There’s a chance that the room upgrade won’t be available of course – but the other benefits are pretty much guaranteed. And generally, if your Virtuoso booking is not prepaid and the rate you reserve requires you pay the hotel on check out, you should also be eligible to earn points and status in the hotel’s loyalty program too. I find it’s definitely worth considering booking a property via Virtuoso if you can leverage value from benefits such as room upgrades, breakfast and food and beverage credit during your hotel stay. You may find yourself needing to book a slightly more expensive rate through Virtuoso when compared with booking direct via the hotel, but in doing so, you’ll unlock access to hundreds of dollars of benefits. Finally, as my example above shows, Virtuoso pricing can also be on par with, if not cheaper than some of the most prominent online travel booking websites – so it’s worth checking Virtuoso out before you decide to give your business to Booking.com! Adele is a passionate traveller and food and wine enthusiast who has recently immersed herself in the world of frequent flyer programs and hotel loyalty schemes. She loves splashing out on luxury travel experiences with her young family using her frequent flyer points. I’ve used a Virtuoso agent for the first time for our travel next year (Japan). The deal we obtained at two hotels was excellent: best rate (flexible and early bird), added benefits as mentioned, plus at one of them, a free night as well. Would definitely recommend as I couldn’t negotiate that with the hotel directly. 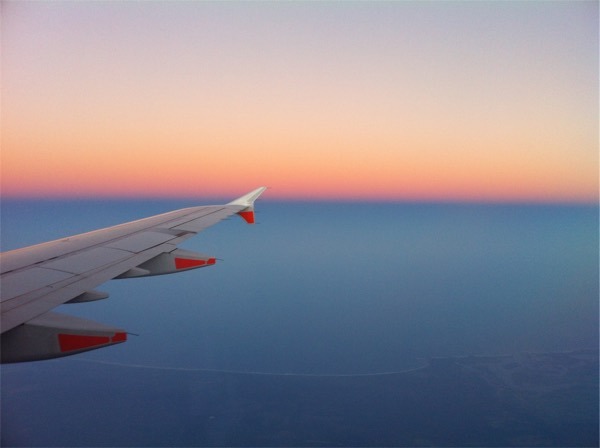 Great article – especially advising the online travel agent! Well done! I used to work for World Travel Professionals (now Orbit World Travel) and Carol in the Brisbane team is amazing. She organises all my trips and my families trips. She’s virtuoso accredited 🙂 It’s true – you do save a bit. Do hotel loyalty program benefits also apply? For example, if I book the St Regis Singapore, will I earn Starwood Preferred Guest credit and enjoy tier benefits? Yes, you do. I’ve booked at the Ritz-Carlton next year, and you still get all the membership points etc. Good info, thank you. I have not used Virtuoso, but question – “if your Virtuoso booking is not prepaid”; is it typical for prepaid at Virtuoso? If so what are cancellation policies? AFAIK Virtuoso is all paid at hotel. We just added a caveat there in case there are any exceptions not aware of! I wish you guys wrote this earlier – I just booked my accommodation 🙁 I’ll be sure to check it out for future trips though!